For Pregnancy and Birth: Three meditations on CD, Mp3 download or Memory Stick. These exceptional recordings offer an effective resource for birthing women and their families. Every woman wants to create the most loving, supportive and safe birth for herself and her baby. Giving birth is truly about letting go: physically and emotionally. Research in the field of pre and perinatal psychology has shown that we do remember our birth. That memory, held deep in the subconscious mind, together with outside influences and information about birth, can engender tensions and anxiety about what is ‘the most natural thing in the world’. 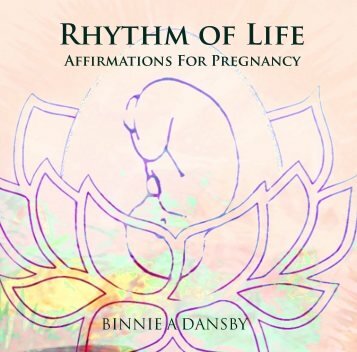 Binnie A Dansby, the author and voice of these meditations, has been working with pregnant couples since 1980. The inspired and life-affirming message conveyed in these recordings has been an integral part of joyful and successful preparation for labour and birth for thousands of mothers; empowering them to achieve the easy, ecstatic birth they wanted and deserve. As Binnie says: ‘A thought planted in the mind, nourished by the breath, takes root in the heart of every cell in the body’. Made with an African ‘Mother Rhythm’ this recording was created to support movement and body confidence during pregnancy, labour and birth.